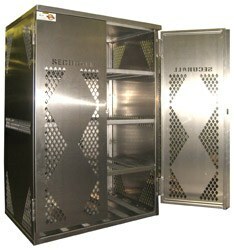 SECURALL Aluminum 12 LP Cylinder Vertical Storage Cabinets provide years of outdoor storage. These cabinets allow you to store LP cylinders vertically, complying with Canadian Standard for Liquid Propane Storage 149.2. Constructed of 12-gauge aluminum, these cabinets are resistant to sparks, corrosion and weathering. Compared to steel models, aluminum cabinets save on shipping charges.